After a week of rain and darkness I can say that autumn is here. Right here in front of my poor little eyes. 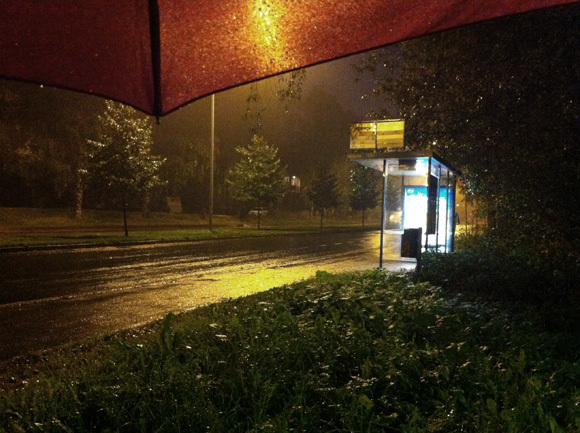 Temperature wise, autumn in Finland will be the equivalent to Spanish winter, but much more dark and rainy. That means that while some Finnish people still walks around with sandals and socks I am already freezing to death in my "autumn" coat. From my (Spanish) point of view, winter lasts pretty much from September to May. 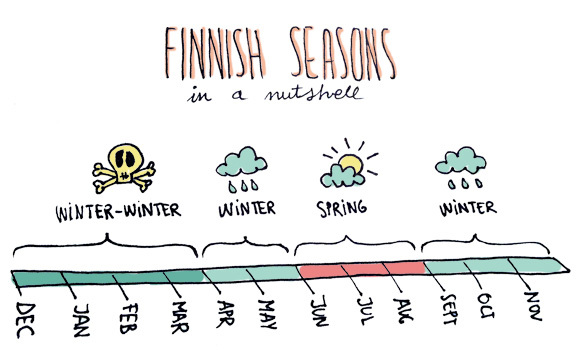 Therefore, Finland has the following seasons: Spring, winter, winter-winter and winter again. So while in June you get around 20h of light, in December you get more or less the same amount of hours of darkness, sweet! 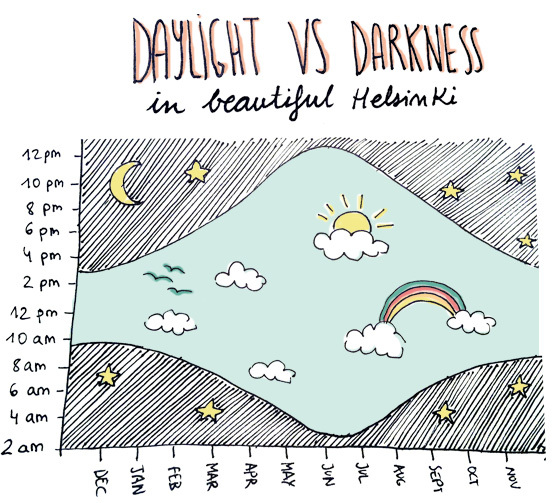 That basically means that you wake up in a cold (and probably rainy) morning while it's still DARK, go to the office to work... and by the time you get out from there, it is totally DARK again. Cannot wait for it, really. Now that you know (almost) everything you would ever need about Finnish weather, let's finish the post officially inaugurating the woolen socks season and wishing a great winter to everybody!!! Funny (or not really) guapa!!!! Ànims!!! and you forgot to mention that at least we most probably always have white Christmas, which is amazingly beautiful and it's not so dark with the snow either, because the snow makes everything so bright. Also, it's not rainy all the time, there a wonderful clear sunny days. When was the last year with a White Xmas in Helsinki? In the last 15 years there were... 5 real white xmas in HKI. The biggest advantage of Finnish weather is that it doesn't actually rain much. I was just trying to be funny in here!! My apologies if I sounded hateful and negative! The intention wasn't to objectively describe Finnish weather (otherwise I would just have put a link to foreca.fi :-P ), I only wanted to show how the winter looks through Spanish eyes. Let's hope we get lots of snow this winter and if so I promise that I'll write about how amazingly beautiful Helsinki is under the snow to make it up for you!! Finnish people do not have any sense of humour. I am sick and tired of them already. Bunch of assholes. Alba, you did an excellent work, very very very funny! Never stop, PLEASE! Descubrí tu blog hoy! me encantó. Coincido con todo desde mis ojos tropicales. Thank You, Alba! This is funny! :) You got a new reader. And yes, I'm Finnish and hate finnish winter from bottom of my heart. Just wondered who the heck got the idea to move here ages ago??? Why our forefathers didn't just stay in Mediterranean??? If, by any chance, you start to wonder why Finnish people are so isolated, hard to approach etc.